I picture spring. And Easter. Warm weather and flowers. And pretty skirts. I picture summer. And the pool. The lake. The beach. The heat. The long days, and the freedom. I picture fall. School starting. Cooler weather. Colorful leaves. Halloween and Thanksgiving. I picture winter. Christmas, and all that comes with it. New Year’s Resolutions. Valentine’s Day. And after Valentine’s Day, my mental pictures end until spring. I don’t picture the end of February. That means I am currently living in un-pictured days. Days with no expectations, no anticipation, no mental images of what they will be like. That means I didn’t picture the blessed warmer weather this year. 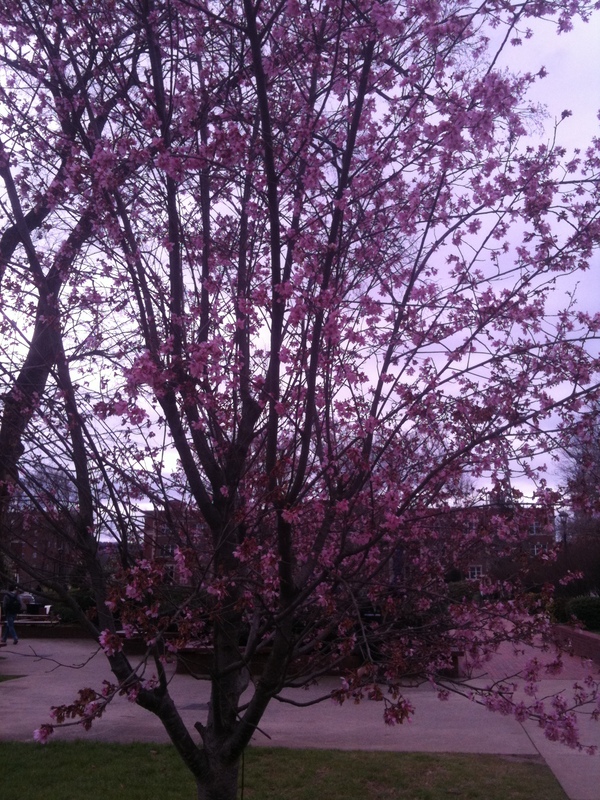 I didn’t picture the tiny, hopeful blossoms blooming in their best, most optimistic pink, on daring trees on campus. I didn’t picture the large elephant sauntering past me, in all his rough, saggy glory, at the zoo the other day. I didn’t picture sitting out on the glider in the warm sunshine, chatting with a dear friend from home about what God has been showing us during Lent. I didn’t picture enjoying a fabulous story time at the downtown library with my favorite little girl in the world. There have been so many unanticipated blessings, unforeseen gifts, un-looked for moments of happiness. And they are nothing like I pictured. Because I didn’t picture them at all. Do you have any un-pictured blessings to share? Here’s my un-pictured blessing, Kim: I didn’t picture coming to your site today and reading a post that has misted my eyes and made my breath catch in my throat.